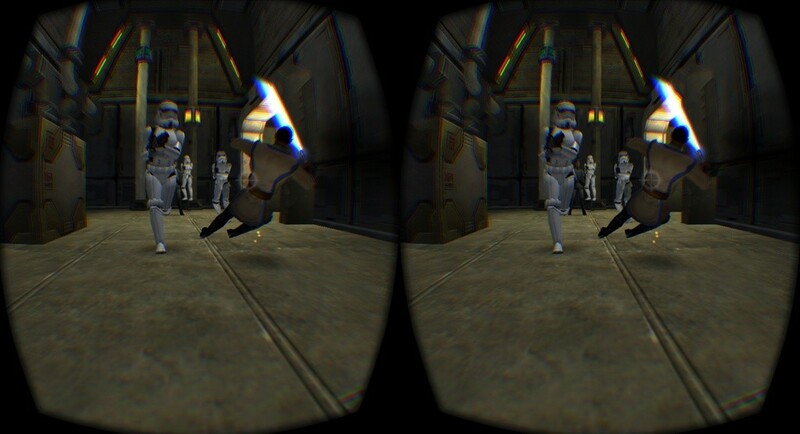 The Oculus Rift DK2 support for Jedi Academy is finally released. It took me longer than expected, but it looks stable now and runs on Windows and Linux. For the DK2 support I had to use the OculusSDK. The OpenHMD library just doesn’t support all the features. It is still possible to build the game with OpenHMD support. Just follow the instructions in the Build.md file. The OculusSDK library is loaded during runtime and the game also works fine without the library. This version can also be played without any Head Mounted Device. All HMD tweaks will be disabled and the game should behave like the original version. Extract all the files from the Windows or Linux zip file into the root directory of your “Jedi Knight III: Jedi Academy” installation and start the “jasphmd” executable. The version was tested on Ubuntu 14.04 and Windows 7. Direct Mode and Extended Mode are supported. Make sure you set the DK1 to Extended Desktop Mode. The current OculusSDK doesn’t work with Direct Mode, OpenGL and DK1. Be sure to mark “jasphmd” as executable and start the game with it. I like very much your project, il be playing jedi academy with my xbox360 controller and analog movements works very nice, i like your project better than openjk , can u improve jedi outcast gamepad support too? thanks and sorry for my english! I’m glad you like the project. I will have a look at the Jedi Outcast gamepad support. Awesome! Do you know if this can be played with Revive (since I’m using a Vive)? I heard that there are some problems with the Revive. I would like to also support the Vive directly, but without a Vive headset it is not easy to do.